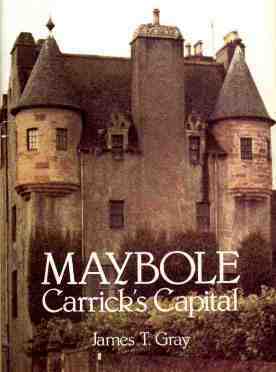 IT has long been thought by many townspeople that Maybole is a Burgh of Regality and this idea was to a certain extent fostered by some earlier writers on the history of the town. There are no authoritative grounds however for such a belief and there is certainly no suggestion of it in the papers from Crossraguel Abbey, and the Abbot was the most likely person to issue such a document. The privileges granted in the Charter of 1516 are certainly more than those ordinarily granted to Burghs of Barony and are nearly equal to those of a Royal Burgh but it is wrong to class Maybole as a Burgh of Regality. The Charter is one of Barony to "my Lord of Cassillis" and the Provost and Prebendaries of the Collegiate Church. It was confirmed on 14th November 1516 by King James V, or rather his guardian John, Duke of Albany, as the King was a young child at that time. It starts by clearly stating that the Charter was granted to "our beloved cousin and councillor, Gilbert, Earl of Cassillis, and our devout priests, the Provost and Prebendaries, of the Collegiate Church of Maybole". The magistrates and "those who sit in Counsil with them" were not to be appointed, as was customary in a Burgh of Barony, by the Earl, but were to be elected annually by the burgesses, and from a "leet" of seventeen the Earl was to appoint the Bailies, and this clause in the Charter gave rise to a bitter dispute between the councilors and the burgesses three hundred years later. The townspeople were granted full power and free faculty to buy and sell within the town "wine, wax, cloth and all other common merchandise", with the "power and liberty of having and holding in the said Burgh, bakers, brewers, fleshers and vendors of flesh and fish informal and all other tradesmen belonging to a free Burgh of Barony". The Charter also stated that "there be in the said Burgh free burgesses and that they have power, in all time to come, of electing annually Bailies and all other officers necessary for the government of the said Burgh". It also granted the right to the townspeople to hold a town market each Thursday and public fairs at Lammas and to have a Market Cross set up forever. The old town cross, erected about this time, stood in the centre of the High Street until it was removed in 1773 as it was causing obstruction to traffic which had increased considerably in the second part of the eighteenth century. "Argent, a chevron Gules between three lions rampant Azure, armed and langued of the second. Above the shield is placed a Burghal coronet and a helmet befitting their degree with mantling Gules double Argent and on a wreath of their Liveries is set for Crest a Dolphin naiant proper and in an escrol over the same the motto-"Ad Summa Virtus". In layman's language the coat of arms can be described as a white shield with a red chevron and three blue rampant lions. The helmet and coronet are common to burghs such as Maybole and the motto can be loosely translated as "To the highest point of valour". In 1639 the town was made the site of the head-court of the bailiary of Carrick and the principal Carrick matters were disposed of in the town for many years afterwards. The magistrates met annually to "fix the stent", inspect the wells in the town and carry out other functions still common to this day when the local councillors fix the rates, have their annual trip to the local water works and deal diligently with the affairs of the town, to their own satisfaction and the continued dissatisfaction of the cronies at the Castle Corner, who, never having been in Council, always know best how things should be done. The town continued quietly to run its own affairs until 1857 when the old Burgh of Barony became an ordinary police burgh and nearly all the old rights and privileges were swept away and much dignity and independence was lost through the march of time.